He is a regular at the local pub and has even taken time out to visit the elderly at a nearby care home. 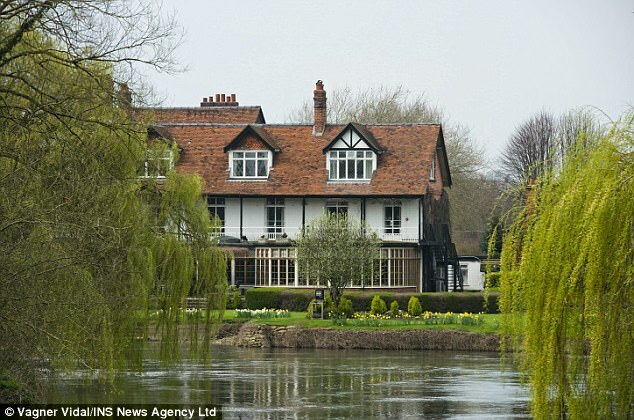 But for one couple living closest to George Clooney and his wife Amal in Sonning, the arrival of Hollywood royalty in the Berkshire village meant a free month-long stay in a swanky hotel. 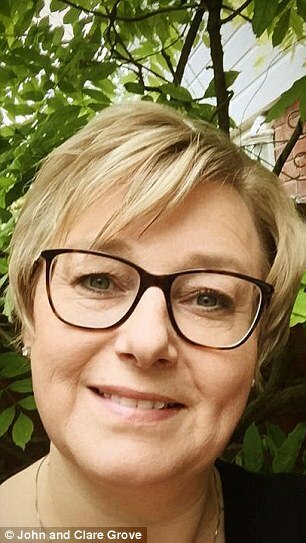 The 55-year-old actor and his wife paid for couple John, 58, and Clare Grove, 49, to live for almost a month in The French Horn, a luxury restaurant and hotel just 300m down the road, while £12m worth of renovations were carried out on their home, it has emerged. Perched on the banks of the Thames, the 19th century former coaching inn is the Clooneys' favourite local dining spot and charges couples £225-per-night to stay at their riverside cottage suites. 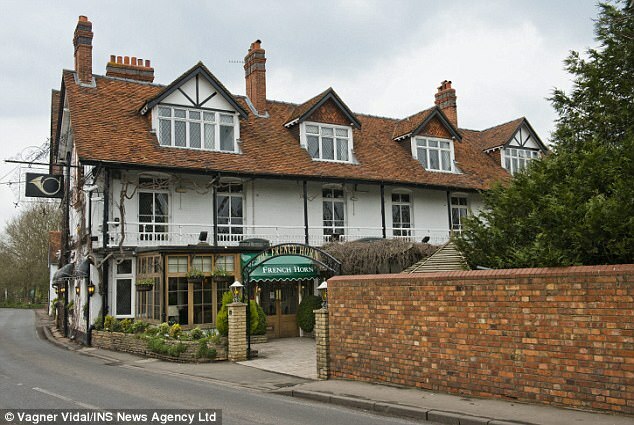 The restaurant, which sells vintage wines for up to £25,000 a bottle, is also a favourite of Prime Minister Theresa May, another village local, who is often seen dining with her security team in tow. The Clooneys are such fans of the restaurant they regularly hire its staff for private dinner parties at their mansion. 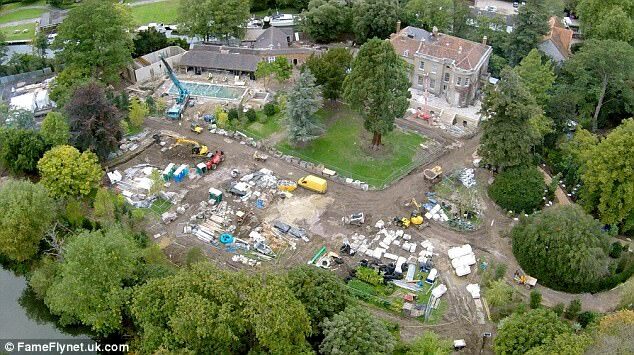 Refurbishment works on the Clooneys' Grade II-listed property, which stands on a five-and-a-half acre island on the Thames, began in late-2015 and included the construction of a 12-seater cinema, subterranean irrigation system, 60ft swimming pool and an astroturf tennis court. For the Groves and their next door neighbour, the only other residents located on the island with the Clooneys, it meant a daily stream of lorries, trucks and diggers clogging up the tiny lane outside their homes. One villager, who did not wish to be named, said: 'It is a known fact in the village that the Clooneys' closest neighbours were very stressed by the building work. 'At the height of the work, there were up to three large building lorries in the small road leading to the Clooneys' house every day. 'But the Clooneys have given a lot back to the community since they moved in. They paid for the Groves to stay in The French Horn during the building work and they often use the restaurant's staff for their private dinner parties. Since the work was completed last year, the Groves have moved from their £500,000 cottage at the foot of the celebrity couple's driveway. It is understood both the Groves and their next door neighbour signed confidentiality agreements about their dealings with the actor and his wife, a renowned human rights lawyer. Clooney bought his Thames-side estate for £7.5m in 2014 after marrying Amal, who is now pregnant with twins, in an extravagant four-day wedding in Venice. The couple submitted plans for a £12.5million refurbishment of the property in March 2015 which were approved by South Oxfordshire District Council in May that year. For months, villagers endured a cacophony of building work. For a time the skyline was dominated by a 200ft crane and the streets filled by a constant stream of HGVs and goods vans going to and from the property. 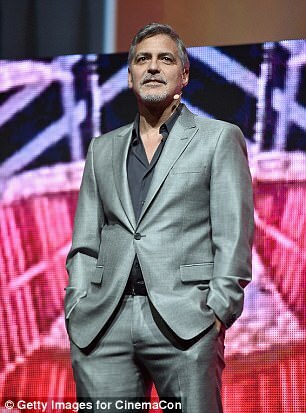 Speaking about the work last year, Clooney said: 'I'm very happy. We are having a really fun time. The Clooneys officially moved into the property, now thought to be worth £23.5m, last year and held a private dinner for a select group of residents in the village, which also counts Led Zeppelin guitarist Jimmy Page and 'spoon bender' Uri Geller among its residents. 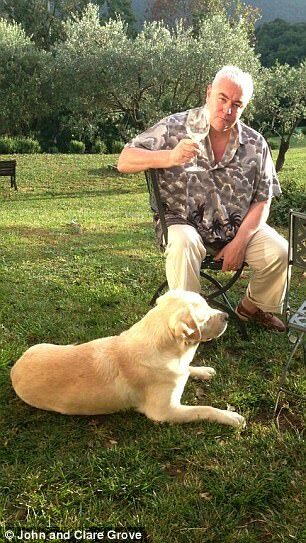 As well as The French Horn, Clooney is known to be a regular at local village pub The Bull Inn, which stocks his own brand of sipping tequila. He was recently spotted in the pub with fellow Hollywood A-lister Bill Murray and the pair were said to have left a $100 bill as a tip for staff. Last month, he made a surprise visit to an 87-year-old fan who wrote to him from a local care home. When approached, the Clooneys and the Groves did not wish to comment. So, how exactly did this story come to surface?????????????????????? Good point, PigPen. And, why did the Groves move out of their home after the renovations on George's place were done? Didn't they want to be George's neighbors anymore? The Groves' cottage is at the bottom of the drive of Mill House. It wouldn't have been a bundle of laughs having that many lorries sitting outside your house. I'm not surprised the Clooneys gave them an alternative and paid for their stay somewhere else. If only everybody did that when major building work was going on! PP- Not sure if we just crossed wires or if you're answering some other question. I completely get why they wouldn't want to stay there while the work was going on, and why G&A would pay for their hotel stay. Lizzy- I haven't answered anything... you perhaps looking at PAN's posting? They moved into the hotel when the work was going on, Lizzy. PP - Mea culpa! You got me. That's what happens to us old fogeys - brain farts! "Since the work was completed last year the Groves have moved from their 500,000 pound cottage at the foot of the celebrity couple's driveway." Sounds to me like they moved away. I just wondered why. Well, everyone didn't sign a confidentiality agreement so any one who knew staff at the hotel workmen , friend of the couple could have told. I think you're right, Lizzy: sounds like they moved out anyway. It doesn't say why, but I guess there's a million reasons for people to move. I just wondered why they moved. Could it be they didn't like their new neighbors? Or, maybe G&A bought them out for some reason? What else is on their island? Is it possible for them to buy up everything and have the place all to themselves? I guess we'll never know, but my first thought is that George may have bought them out. Gives them more privacy on their island. Actually, that was my thought, too. Especially if their dealings with the Groves during construction were problematic. It could be they felt there might be problems in the future, too. Could just be that George just wanted the whole island to himself (not sure if that's feasible - are there any other homes there?) just to ensure his own privacy. I'm sure that it wouldn't have been too hard to persuade them to move - the flood insurance for that area must be horrific so a move to somewhere on higher ground would probably appeal. Isn't tge theatre on the island as well? I can't imagine them buying this as well (if they really bought out the couple). The couple moving could have nothing to do with George, peoples lives change maybe they were planning to move before George and Amal bought there. The dinner theatre shares the island with George and Amal's house, yes, and is a working watermill (great views of it in the bar!). George has joked that acting there is his pension plan. It is hugely popular (or should I say bigly!) and there is no way George would buy it, although he may already be a patron, and went to a production after Christmas. The Groves used to run a charter boat business there for parties (there is a boatyard there too) but sold the business last year so moved. George and Amal Clooney gave neighbours in their Berkshire village a £45,000 compensation package for the disturbance caused by renovations to their estate. 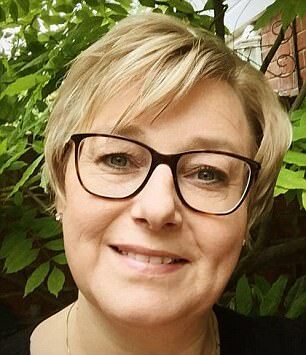 The deal agreed with John Grove, 58, and his wife Clare, 49, included a holiday to Corfu, a six-week stay in a luxury hotel and a £30,000 lump sum. 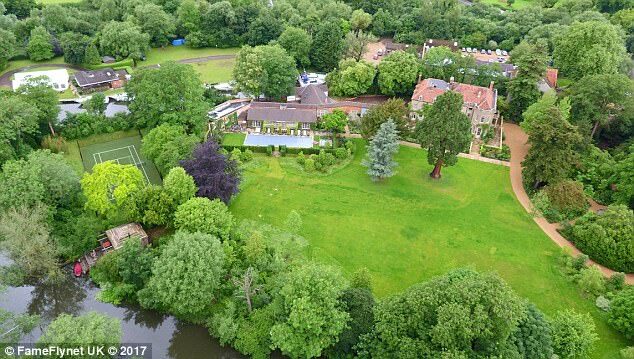 In addition to the package – which curiously also included a replacement vacuum cleaner – the Clooneys paid for the Groves to rent a £780,000 cottage down the road from their home in Sonning. Refurbishment works on the Clooneys’ Grade II-listed Thames-side property began in late 2015, and included the construction of a 12-seater cinema, subterranean irrigation system, 60ft swimming pool and an astroturf tennis court. For the Groves and their next-door neighbour, it meant a daily stream of lorries, trucks and diggers clogging up the tiny lane outside their homes for a year. At one point, the Clooneys had 1,000 mature trees transported to the estate by lorries and planted around the outskirts of the property to protect their privacy. A source said: ‘It is a known fact in the village that the Clooneys’ closest neighbours were very stressed by the building work. At the height of the work, there were up to three large building lorries in the small road leading to the Clooneys’ house every day. During the height of the work in September 2015, the Clooneys paid for the Groves to take a week-long break on the Greek island of Corfu. Upon their return, they moved into The French Horn, a hotel and restaurant 300 yards from their home at the expense of the Clooneys for six weeks. Perched on the banks of the Thames, the 19th century former coaching inn is the Clooneys’ favourite local dining spot and charges couples £225 a night to stay at its riverside cottage suites. The restaurant, which sells vintage wines for up to £25,000 a bottle, is also a favourite of Prime Minister Theresa May, who is often seen dining with her security team in tow. The Clooneys are such fans of the restaurant they regularly hire its staff for private dinner parties at their mansion. After staying in the hotel became inconvenient for the Groves, the Clooneys secured them a £780,000 cottage in the village for a year, with all rent and bills paid by the Hollywood actor and his human rights lawyer wife. It is not known how much this cost overall. Finally, the Clooneys agreed to make a one-off payment of around £30,000 to the couple. Since the work was completed last year, the Groves have moved from their former home – a £500,000 cottage at the foot of the celebrity couple’s driveway. Neither the Clooneys nor the Groves wished to comment on their dealings with one another. Clooney bought his estate for £7.5million in 2014 after marrying his wife, who is now pregnant with twins, in an extravagant four-day wedding in Venice. The couple submitted plans for a £12.5million refurbishment of the property in March 2015, which were approved by South Oxfordshire District Council in May that year. For months, villagers endured a cacophony of building work. For a time the skyline was dominated by a 200ft crane, and the streets were filled with a constant stream of HGVs and vans going to and from the property. Speaking about married life last year, Clooney said: ‘I’m very happy. We are having a really fun time. The Clooneys officially moved into the property, now thought to be worth £23.5million, last year and held a private dinner for a select group of residents in the village, which is also home to Led Zeppelin guitarist Jimmy Page and ‘spoon bender’ Uri Geller. 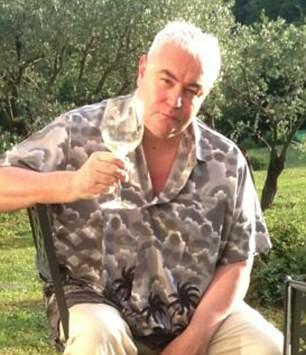 As well as The French Horn, Clooney is a regular at local pub The Bull Inn, which stocks his own brand of sipping tequila. He was recently spotted there with fellow Hollywood A-lister Bill Murray and the pair were said to have left a $100 note as a tip. Last month, Clooney made a surprise visit to an 87-year-old fan who wrote to him from a local care home. I just wonder if this was all amicable especially since the Groves decided to move after all was said and done. It just seems a bit bewildering to me. If the confidentiality agreement pertained to the inconvenience 'package' George offered the Groves then how did those details get out? If not, then wonder what the agreement covered? Or maybe there never was a confidentiality agreement (fake news). It's all a bit curious. It's probably amicable now that they've sorted it out. I guess that there was an NDA but still, people talk. All the 'journalist' would have had to do is talk to a bunch of people in the area and put together all the snippets of info, then fill in the rest to make this 'story'. It's interesting that nothing's been heard from the other neighbor - the people who live next door to the Groves. I wonder if they struck a deal with G&A, or if the mess didn't bother them enough to profit from it. Something a bit unusual in Mail. Positive comments!! party animal - not! wrote: Something a bit unusual in Mail. Positive comments!! Devil's advocate time................... maybe they just didn't want to be neighbors with George. He can be a bad neighbor ( look at some of the crap he does at Como without consideration for neighbors. what- you ask. How about his late parties that echo all over the neighborhood. yeh George, you own the property but not the neighborhood. Give an example you say- glad to.... ayone recall one of his favorite stories of getting his house guests tipsy and then daring them to jump into the lake au natural?? Guests include ( forget first name) Rose PBS interviewer. Doubt his 4th of July party breaks by 11PM. yeh- I'm cranky at his Nibbs today. Papers reporting how he's done soooooooooooooo much for the neighborhood, to keep peace and be a great guy. What I see is him throwing money around to shut people up. Well IMO George is a great guy and Sonning is probably lucky to have him and Amal as neighbors. And I also think he is for the most part very thoughtful when it comes to others ... and generous on top of that. And I also think he probably feels badly about all the construction and noise that occurred on his property. From news reports a year ago it did sound like he was upsetting the neighborhood quite a bit and so now he is trying to make amends. I don't think I've ever read of anyone who has claimed that George wasn't neighborly. I've never heard of stories out of Como of neighbors complaining about George making too much noise when he had parties. The villas are not that close together. And Lake Como is a pretty big lake so who is going to notice his guests taking a dip in the lake at night? PP - It was Charlie Rose. And Walter Cronkite, too. And lots of others. I'm with Donnamarie on this. I never heard that the neighbors complained about his Como parties - although that doesn't mean he can't be as annoying a neighbor as the rest of us. I hope whatever's spoiling your day goes away soon! I know of nobody in the Como house environs who has ever noticed or complained about any noise from the property. It'a a lovely set-up, with huge grounds bordering the lake and all the surrounding houses belong to him. He's also built a car park for residents and contributes to all sorts of projects in the village. And he's always claimed that any jumping into the lake has happened at 3 a m when the Italian paps are in bed........! Okay- I see your point re: complaints. But again, being the devil's advocate.... who can say for sure that no one has indeed complained- and been ignored. This is George we're yapping about- former mayor officiated wedding, etc etc etc. It's Sinatra back from the dead. George Clooney, Amal Alamuddin's Inconsiderate Behaviors Cause Neighbors To Call The Cops? George Clooney's neighbors are not very happy of him and Amal Alamuddin living in the area? Home renovations are certainly normal in all neighborhoods. 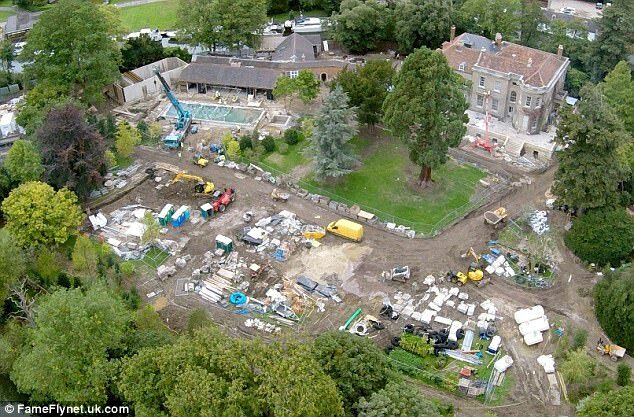 But it seems that George Clooney and Amal Alamuddin are making some drastic changes to their multi-million dollar English estate that it took them for several months now to renovate and it still not finished. As if the constant noise is not enough, several paparazzi are also swarming the area, making the neighbor less and less happy about living near the famous actor and his lawyer wife. However, George Clooney and Amal Alamuddin may have already expected their neighbors to not be too pleased with their home renovation and they decided to make it up to them. Celeb Dirty Laundry revealed that the couple have spent over $50,000 in gifts to possibly keep their neighbors from picking up their phones and calling the cops on them. The pair tried to be good members of the society despite the circumstances. While there is no word as to what exact gifts did the couple send out to their neighbors, but it seems that their friendly gesture has been working as there are no negative reports about their home renovation so far. 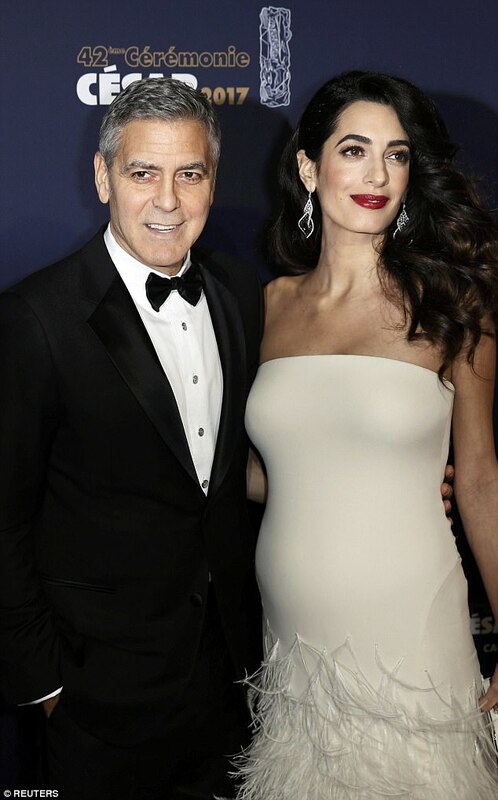 George Clooney and Amal Alamuddin are reportedly planning to raise their twins in England, so the pair are definitely trying to win their neighbor's by giving them lavish gifts in exchange of their understanding and silence. Being in the public eye for almost four decades, it only makes sense that George Clooney would want to settle down outside Hollywood. Although the couple have not commented on this matter, "The Monuments Men" actor's friend are clearly happy for him after learning that he's going to be a a first-time dad soon. "I'm very excited. Obviously we're friends of parenthood. I think it's incredible for George and it really took Amal, I think," Cindy Crawford told E! News at the time. "It was like all of a sudden he might get married and he might have a family. It's incredible. We are very excited for them." The supermodel's husband, Rande Gerber then jokingly added, "I'm not sure he'll be changing diapers."